Sunderland defender George McCartney has returned to Leeds United on loan until the end of the season. 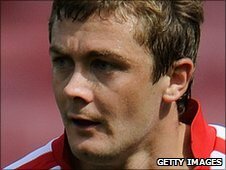 The 29-year-old made 17 appearances while on loan at the end of last year, when Leeds went 12 matches unbeaten. Manager Simon Grayson told the club website: "He did well over the course of his last loan spell. I know what he can bring to the table." McCartney is now in contention for a starting place for the visit of Scunthorpe on Saturday. But he is ineligible for Leeds' FA Cup third round replay against Arsenal at Elland Road four days later. "The additional revenue earned from the Arsenal game has helped make this loan possible as we continue to invest both on and off the field," said Leeds chairman Ken Bates.